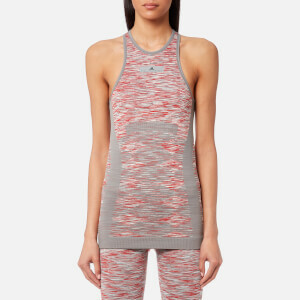 The adidas by Stella McCartney ‘Run’ vest has an all-over floral and snakeskin print. Made from sweat-wicking and fast-drying Climalite fabric, the running vest has a stretchy design that will move with your body during training session. The tank tee is engineered with Climacool mesh inserts on the racer back to keep you cool in warm conditions. Complete with a crew neck, an elasticated hem to keep the vest in place and a reflective logo on the lower back.